Faculty Led Programs (FLP's) are short term programs run over 2-5 weeks, designed and led by UC Faculty Members specifically for UC degrees. They function like an international field trip as part of a UC unit. This program offers students a unique opportunity to gain an insight into environmental natural resource management programs in New Zealand. NZ is a natural laboratory for environmental science research and practice. This international program will create the opportunity to work in collaboration with NZ Environmental Science Practitioners with an emphasis on conservation biology and earth science. Students will each complete a literature review and program of research on an aspect of NZ environmental science and coordinate a field day for their peers as part of the tour program. Examples would include: characterizations of volcanic landforms in the Auckland monogenetic volcanic field, explore controls on geothermal activity in the central North Island, work with seabird researchers endeavouring to understand the impacts on seabird distribution, reviewing the geomorphology, glacial and periglacial landforms of the central Southern Alps and more..
Nepal is known for its natural beauty and vast mountain ranges containing 8 of the 10 highest peaks in the world. Nepal lies along the southern slopes of the Himalayan mountain ranges and has an estimated population of around 30 million. In April 2015 parts of Nepal were devastated by a 7.8 magnitude earthquake, the regions worst in 80 years killing over 8000 people, leaving thousands injured and flattening villages. Today, many villages are slowly rebuilding. In collaboration with the Canberra based, REACH for Nepal Foundation, we will be visiting rural Nepal in the Pokhara Valley to help rebuild, educate, and assist the children within a local Nepali community. - Academic project: You will work on a health-related project that is specific to the community we are visiting during Semester 2 and deliver the project while in Nepal. - Rebuild project: You will assist with a rebuild project, this could be the building of a wall, part of a classroom or playground for the local school. Malaysia is a destination that offers rich cultural heritage with ancient traditions, inspiring architecture, a fusion of cuisines plus remarkable natural landscapes. Visit Kinabalu Park, Malaysia’s first UNESCO listing, Tioman Island with clear water beaches or Batu Caves and the temples within. Malaysia is a destination full of adventure, perfect for a truly in depth cultural experience. With a range of industries, Malaysia offers internship opportunities in: international relations, business and government, law, marketing, communications, public relations and tourism. New Colombo Plan Mobility Grants ($3000) available for eligible students! Discover futuristic skyscrapers, have breakfast with Orangutans or wander through the Gardens by the Bay in the ever wondrous city of Singapore. A metropolis with a vibrant history, Singapore is rapidly leading the way for the modern world. Explore their extensive art scene, visit ancient temples or let your inner foodie run wild with amazing street food. A unique hub of culture, history and innovation creates a recipe for inspiration. With a choice of industries, Singapore offers internship opportunities in: graphic design, landscape design, communications, industrial design, events and business, sports management and sports science. A country at the heart of Southeast Asia, Thailand combines some of the most historic and ultramodern communities in the world. With busy city skylines, white sandy beaches, ancient temples, jungles, and of course their exotic cuisine – Thailand is an exciting destination. A magical mixture of new and old creates an experience as unique as its culture. Through a range of industries, Thailand can offer something for everyone! Internships are tailored to each individual student with opportunities in: IT, marketing, design, law architecture, public relations, science, health, accounting and business. The Universities Australia (UA) - China Education Association for International Exchange (CEAIE) China Internship Program provides students with a comprehensive mobility opportunity, tailored to students with little or no previous experience in China. You will participate in the program alongside students from six Australian universities,which provides a unique opportunity to build linkages between Australian universities, and between Australia and China. The program will provide comprise of a four-week supervised internship at a leading Chinese or global company. You will be provided with pre-departure, on arrival and online orientation programs followed by a two-week full-time university curriculum including classes on introductory Mandarin, Chinese culture and business. Housing is on-campus accommodation at a Beijing university and you will be partnered with a local Chinese university student or ‘buddy’ to assist with language development and everyday life. This program is tailored to assist those students who have not previously travelled to Asia or who have no prior knowledge of China. With a range of industries, the CEAIE program offers internship opportunities in: film and media, architecture, environmentalism, fashion, health and publishing. Singapore is quickly becoming the leader in design of products, apps and services that can improve the health and well being of citizens across the globe. This exciting tour will give you an introduction to the amazing multi-cultural influences of Singapore and an understanding of design thinking and application. Applications for this course have now closed. Applicants should receive an outcome for this shortly. This two week intensive program offers students the opportunity to experience and understand heritage management in the culturally diverse, dynamic urban environment of Singapore. Students will be immersed in Singapore's vibrant multicultural landscapes and will gain skills and knowledge in heritage management and conservation through experiences in museums, galleries, historic buildings, landscapes and urban precincts. Applications for this program have now closed. Applicants should receive an outcome in the next 2-3 weeks from the Study Abroad Office. This Overseas Study program for Bachelor and Master of Architecture students is framed around an intensive overseas faculty led study trip to JAPAN. The program interrogates cultural manifestations of Japanese architecture and the contemporary city through the lens of perceptual and existential space – within a conceptual framework entitled Material / Immaterial. New Colombo Plan Mobility Grants ($3000) available for eligible UG students! Applications for this course have now closed. Students should expect to hear an outcome in the next 2-3 weeks. This two week program will offer advertising, public relations and communication students a diverse and robust learning experience across Malaysia and. Singapore. Both are countries with a diversity of cultures. Students will gain knowledge and experience through industry visits to companies and agencies, lectures, workshops and case studies. During the trip students will experience diverse marketing styles, advertising and PR and communication elements. Local experiences and cultural tours will be included to ensure the program is well-rounded. Applications for this course have now closed. Applicants can expect to hear an outcome in the next 2-3 weeks. 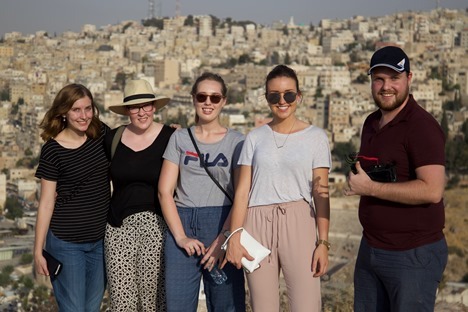 The #AMEJE19 study tour, operated in conjunction with Australia-Middle East Journalism Exchange (AMEJE) will offer six UC journalism students the opportunity to experience the Middle East first hand. #AMEJE19 will allow delegates to immerse themselves in unique cities and cultures, learn about different media systems, and build professional networks that will be invaluable throughout their careers. Deans Faculty Scholarship ($3000) available for eligible students. Applications for this course have now closed. Applicants will received official communication in the coming weeks. This two week study tour will give a group of UC students the opportunity to learn about the world’s largest games and interactive design industries in the UK and Europe. Applications for this program have now closed and are under consideration. Applicants should receive a response the Study Abroad office in 2-3 weeks. First and second round applications for this Faculty Led Program have now closed and are currently under review. You should receive an outcome to this in the next 2-3 weeks. The 2019 program provides an opportunity for participants to immerse themselves in the professional and cultural setting of Shanghai, China for 16 days. Before studying abroad, students will complete a weekly placement preparation course aimed at developing cross-cultural understandings and intercultural communication skills. This course includes the study of culture, internationalization, international education and Chinese language. Applications for this program have now closed and applicants have been notified of their outcomes. This two week international program offers a unique opportunity for medical imaging students to experience diagnostic radiography / medical imaging in the Pacific islands. Students will visit Fiji, with most of their time being spent at the Fiji National University (FNU) in Suva where they will undertake classes with the equivalent year medical imaging students. During the visit students will give presentations to the FNU students on what studying medical imaging is like in Australia; undertake clinical placements in Fijian hospitals to experience how radiography is performed in Fiji and will also engage in social and cultural activities with the FNU medical imaging students and staff. To apply for this program, see here. This two week faculty led program provides UC Midwifery & Nutrition students with a unique work integrated learning opportunity in an international facility. Students will hone their skills in an international setting, make valuable contacts and be immersed in very different healthcare settings. This 14 day program in Samoa offers students a chance to learn more about health and wellness in the South Pacific. Based in the capital, Apia, we will be visiting the National University, the local sports centre, the Tupua Tamasese Meaole Hospital, the Samoa Cancer Society and related offices, the Australian High Commission and local schools. Area of study: Exercise Physiology and Rehabilitation, Public Health and Nutrition. First round applications for this program have now closed. Applicants can expect to recieve an outcome in the next 2-3 weeks. Late applications may be considered. To submit a late application, please apply here. Give your UC degree some European flare! On this three week tour you will visit Madrid, London, Portsmouth, Lausanne, and Geneva. There will be ample time to explore the rich history and cultures on offer alongside of a fantastic academic program. Week one will be in Madrid where you will attend a week long intensive international sport marketing school at the Universidad Europea de Madrid, enjoy traditional Spanish meals, and go to the last match of the La Liga - Real Madrid vs Betis Sevilla. The second week you will spend in London and Portsmouth with activities such as touring Olympic Park, football stadiums, Lords cricket ground and watching County cricket in the Isle of Wight. The third and final week will be spent in Lausanne and Geneva, Switzerland, where you will visit the IOC museum, International Federations, the United Nations and more. From an academic perspective, the content of week one will focus on international sport marketing and the business of sport. Weeks two and three will feature a more diverse range of topics and industry based experiences including event management, media relations, broadcasting, diversity and more. With 6 credit points and OS-HELP loans available for eligible students this tour represents amazing value for your UC education experience. Area of study: B/ Sport Management, Sport Media, Marketing and Tourism. Applications for this Faculty Led Program have now closed. Applicants should now have received their outcomes. This faculty led program gives UC students the opportunity to undertake one of their clinical placements in an international facility. The program will provide students with a unique opportunity to hone their skills in an international setting, make valuable contacts and be immersed in very different healthcare settings. The clinical placement will base students at Vaiola Hospital in the Kingdom of Tonga in collaboration with the Tupou Tertiary Institute (TTI). This placement includes rotations through acute, surgical and primary healthcare. Students will gain first-hand experience and insight into healthcare service delivery in the Pacific and develop cultural awareness and cultural sensitivity. The program will be based in the capital of Tonga, Nuku’alofa. Students will work under the direct supervision of a Tongan Registered Nurse as well as being supported by a staff member from the Discipline of Nursing at UC. This two-week program offers students a unique opportunity to gain an insight into law and justice processing in Bangkok and Chiang Mai, Thailand. Student will visit a variety of local NGO’s, Government and United Nations to understand the process from a variety of aspects within Thailand. Students will spend time at the Chiang Mai Correctional Institution for Women as well as the maximum security Klong Prem Central Women’s Prison in the Chatuchak District. Students will also be given the opportunity to attend local institutions to listen to lectures discussing topics relating to law, justice and politics within the region. Applications for this course have now closed. Applicants can expect to hear in 1-2 weeks. This two and a half week International Professional Practice program offers students a unique opportunity to gain an insight into the world of cutting edge medical research in China. There has been an unprecedented boom in biomedical research in China, fueled by its exponential economic expansion. The placement is envisaged as a ‘hands-on’ immersive activity based at the Shanghai Public Health Clinical Center. The students will spend time in the clinical laboratory of a leading hospital as well as medical research laboratories.